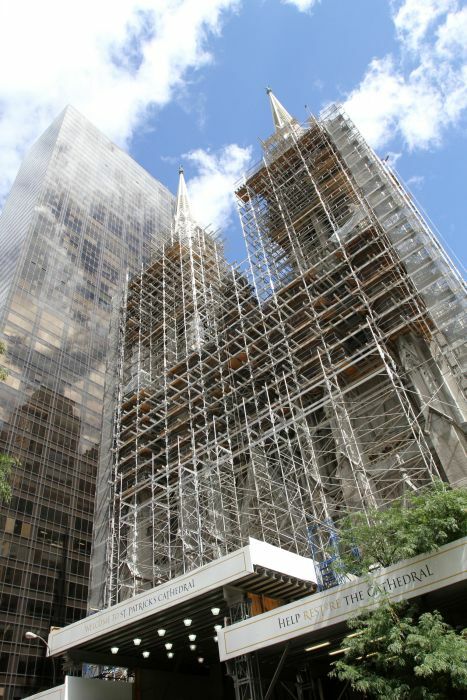 A very instructive event was held this week at the Center for architecture: Murphy Burnham & Buttrick Architects presented the Innovation and New Technologies used on the St Patrick’s Cathedral Conservation Project. The subject line might look precise but the architects actually took us far beyond and gave us some insights on this impressive project. To introduce the project itself, we start with a history summary of the cathedral. I’ll spare you the details and concentrate on a few facts. The name to remember here is James Renwick, the architect of the cathedral. 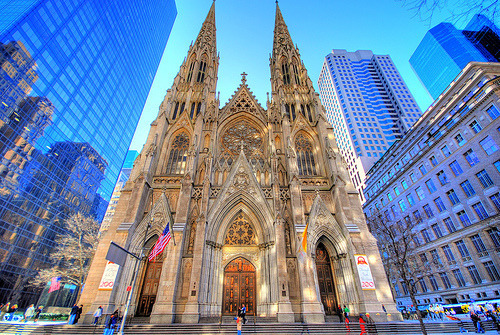 The neighborhood on 5th avenue greatly developed around the church after its construction. The opening had a dramatic impact on people: NYC was established as a place where amazing architecture can happen. Renovations have been re-ocurring over time and took many steps. MBB Architects’ intervention is the tail end of many previous ones. The actual work consists mostly in stone, plaster and stained glass repairing/replacing. Also, the heating and fire systems, and the landscape improvement took part of the deal. Basically, this is all about fixing, cleaning out and improving the cathedral. When the project architect comes on stage, we switch to a more hands-on approach with juicy details on how they did it. For him, and contrary to general misbelief, it is not that hard to find good craftsmen to do restoration work. The hurdle is to find the money to pay them! To be able to work efficiently, precise plans were necessary. Imagine the number of hours spent on site to measure and evaluate the condition of every corner of the cathedral! This was made by laser and hand drawing for details. When possible, stones were “sounded” to check their condition. Given its dimensions, the cathedral is exempt from many structural reinforcements usually necessary. This was achieved thanks to the use of wood and plaster instead of stone for the ceiling. With many past renovations, going back to the “original” color was not easy. In addition to carefully uncovering past layers, the architects studied paintings from archives. The loose or missing mortar was another concern, and represented a relentless work to get it off and/or replace with the appropriate one. As for the stones, the purpose was not to replace every missing one of them but to show what was the original intended design. And with five different types of stone, how do you decide to clean them up? There are many different methods to do so, but they finally went for the “rawtep” [not sure about the spelling], which is a powder projected on the stone to clean it without damage. The management of this whole process is the big part of the project. The architects used the Autodesk BIM 360 Field program. CAD drawings, precise and reporting the estate of every piece of the building, are all linked to a cloud database. The check-ups and decisions made on site are thus directly uploaded to the system. Updates and modifications become instantaneous. With such a publicity, everyone in the room wanted their office to buy the app! The specialist of stained glass then takes over to present the exceptional collection of the cathedral. 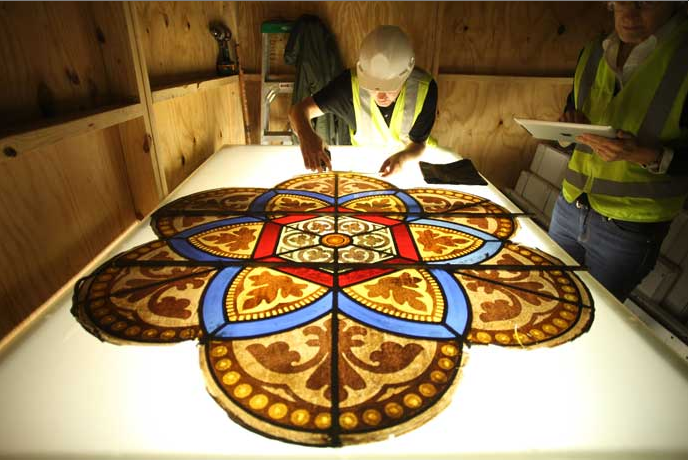 The oldest stained glass piece is French and dates from the 1870s. Four artists were identified, each with his own style. The architect guides us through the various challenges of replacing/repairing/stabalizing stained glass. When a repair included a large piece, it was signed by the craftsman (Botti Studio) as was signed the original. Some are located behind exterior protective glazing, sometimes in very bad shape. Sun study, time lapse and total radiation research were made to establish the level of protection needed for every single window. One of the problem was to get air between the two layers. A craftsman finally came up with this brilliant idea of creating a vent by the tiny removal (no more than 3/4 inch wide) of small pieces at both bottom and up the window to create a natural ventilation effect. The glazing itself was eventually replaced with transparent UV improved glass. At other locations, the stone was to reinforce to avoid the pressure it put on stained glass. Instead of a transversal bar – blocking the view – to fix two stone pieces, metallic rings, shaped to follow the void pattern, were applied along the aperture. Like the exterior reporting, every repair made or to make on stained glass windows was precisely pinned on iPad. The original drawing for this was extracted from pictures. The fire and heating systems were another big part of the project, certainly more technical but not easier! With a nave vault made of wood and plaster instead of stone, an efficient fire system is critical for safety. The attic is basically a timber box, ready to ignite anytime. The system is all located in the attic, ready to spill millions of small droplets of water. Three dimensional distribution and the mix of water with nitrogen enable this more efficient system to use only 10% of the amount of water a conventional system would. Because high-pressure is needed, the installation is separated from the city water system: tanks of water and nitrogen are directly located at attic level. As for the geothermal system, it sinks very deeply (up to 1800feet!) into the ground. A total of ten wells are located around the cathedral. This renewable system reduces energy consumption by 40% and enables the community to save more than 2M$ a year, just in maintenance. What else is there to say except that this renovation project is one of a kind. Let’s just celebrate this mastery piece of history in the heart of NY and applause the architects for their attentive work on it!